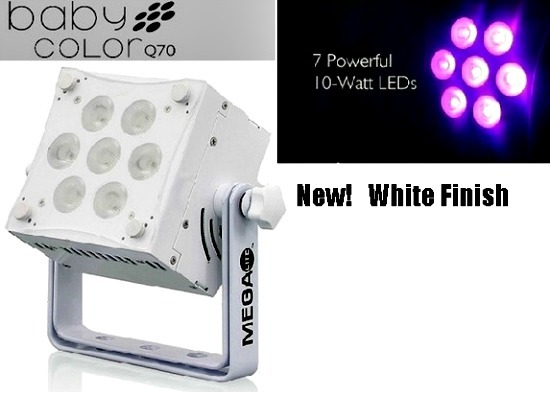 The Baby Color VW from Mega-Lite is a bright variable white fixture that’s ultra-compact in size. The unit is equipped with 7 5-watt LEDs and has less than a 5″ square body. The fixture has a 20° beam angle and comes with a diffuser that increases the beam angle to 25°. 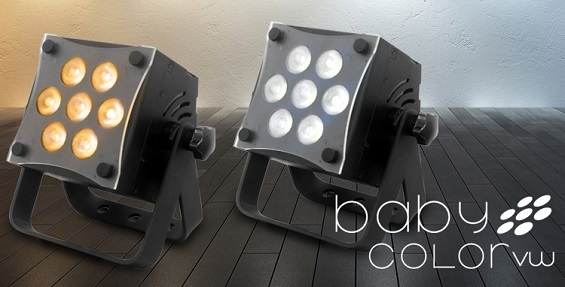 The Baby Color VW is controllable via DMX 512 and has amber, warm white, cool white, dimmer, CTO and strobe channels. It also has the control options audio trigger and master slave. The Baby Color VW has a double mounting yoke so it can to be set on the floor or hang from a structure. It has a digital display designed for ease of use. And, it is equipped with power con in and out and 3-pin XLR connection inputs and outputs.